What: Where No Flag Has Gone Before at Piet Zwart Institute show titled 'No Such Thing As Repetition' curated by Inke Arns. Where: Rot(t)terdam Roodkapje space in the centre of Rotterdam. Where No Flag Has Gone Before was a live blue-screen studio installation enabling visitors of the exhibition to reenact their own glorious moment of the first planting of the American flag on the surface of the moon. The end-product of the installation was a distilled extract of the whole experience, simultaneously serving as its documentation in video form. 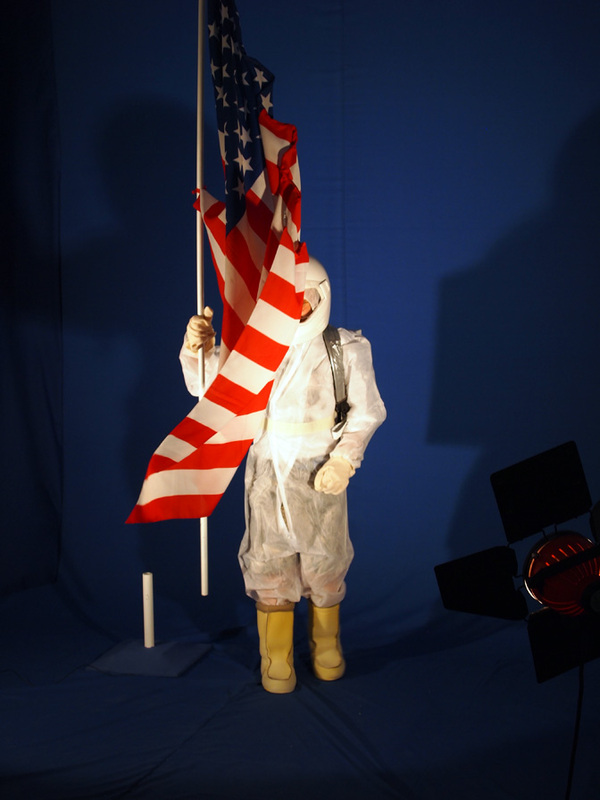 Complete with props and costume – consisting of a large American flag together with the flag pole, homemade space-suit pieced together with white disposable painters' coveralls, cardboard, bits and bobs from an old coffee machine, white spray paint, gloves, an unused back-pack, motorbike helmet and the foam insoles of moon boots – I helped visitors gear up for the arduous journey to the moon. Once prepared and dressed, the newly-initiated astronauts step into the blue-screen area where the upright flag awaited them to pick it up and gradually plant it back. The participant had 20 seconds to perform this act as it was being recorded and composited in the computer program Pure Data. The background image of the very first participant's video was the iconic photograph of Buzz Aldrin standing next to the American flag on the moon, taken during the 1969 Apollo 11 mission. The only difference was that in this video, the participant replaces Buzz and becomes the national hero. Consecutive video recordings of people reenacting the planting of the flag serve to become the background footage for the next participant. Gradually accumulating, the final video graphs the episodes of reenactors as colonisers on the moon. Whether the 1969 moon landing event was real or staged has been at the centre of much debate. Shifting focus away from its contested reality, I decided to rather scrutinise the very moment that has inscribed itself so deeply into the collective global consciousness: that of the planting of the American flag on the moon. I selected to render this iconic image as a political symbol of colonisation in the name of technological progress. The moon landing is one example that clearly reflects the grand story of ideological motivation driving technological progress, more specifically anticipating the ongoing US program of outer space colonisation as an incentive to preserve self-serving powers. Certificates of Appreciation were also made for the participants of the installation. Click here to see. Photography by Nataša Sienčnik, Michael Murtaugh, Inke Arns, Dušan Barok and myself. Technical assistance by Aymeric Mansoux, Michael Murtaugh and Mr. Stock.